Carbo-Fuel powder works with A.T.P. in the body to form a special high energy bond that replaces energy in the muscles of performance horses. 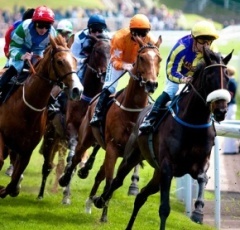 That is the type of energy used by horses in sudden bursts of speed as in sprinting. Carbo-Fuel is a very effective glycogen loading oral supplement for equine use. Research on horses has shown that loading their muscles properly can lead to improved performance. Carbohydrate loading as such is safe and works. The total treatment program (3 days prior and including the day after competition) leading to a race or other type of competition should not exceed 16 ounces. This supplement can be mixed into feed or given orally with a dose syringe. The enclosed measure holds four ounces filled. 10 total treatments per 10 pound bucket. For animal use only – store in a cool, dry place out of reach of children.